Childbirth is typically straightforward but complications can become dangerous when access to care is limited. Médecins Sans Frontières/Doctors Without Borders (MSF) is working throughout the world, to meet the needs of both and mother and child and prevent situations like the one Susanne Mortazavi faced in rural Democratic Republic of Congo. "I’m woken up suddenly at 6.30am when one of our guards knocks on the door of my hut. There’s an emergency at our hospital. A taxi driver has just arrived with a newborn baby on the back of his motorbike. The baby is listless and floppy. We’re able to quickly remedy the baby’s extremely low blood sugar. The driver tells us he travelled through the night together with the baby’s parents to try and get to the hospital in time. The baby’s mother had been bleeding heavily since she gave birth the previous day. But on the way, she was too unwell to continue the journey by motorbike. The taxi driver had been forced to leave her and her husband at the side of the road in between two villages. Her husband instructed the driver to take their baby to the hospital in Shamwana and ask MSF for assistance since it was impossible for them to reach us. If a woman is bleeding heavily after childbirth and the placenta hasn’t come out it can be life threatening. I’m aware that this woman needs urgent medical care for her to have a chance of survival. The lack of transportation here in Katanga means that it is practically impossible for someone on their own to bring an unconscious person to the hospital. Even if her husband found people to help him with a stretcher, it would take hours for them to walk to Shamwana. In 15 minutes we manage to arrange two jeeps (we always travel in convoy in case something happens to one of the vehicles). A midwife, a nurse, another doctor and I set off in the direction the taxi driver tells us. We know they are probably still on the road between the two villages, anything from 5 to 40 km from Shamwana. I sit in the front seat and fervently hope that the woman is closer to the nearest village. Although there’s only about 35km between the two villages, it will take us an hour to reach the most remote village as the road is so bad. For this woman every minute could be vital. As soon as we pass the first village, we start scanning the roadside ahead of us. It’s difficult to see clearly as trees, shrubbery and overgrown vegetation flank the dirt road. A couple of times we see people walking along the road, transporting things on bikes or on their heads. But there’s no woman by the roadside, and no man waiting desperately for our vehicle. An hour later we drive into the most remote village. 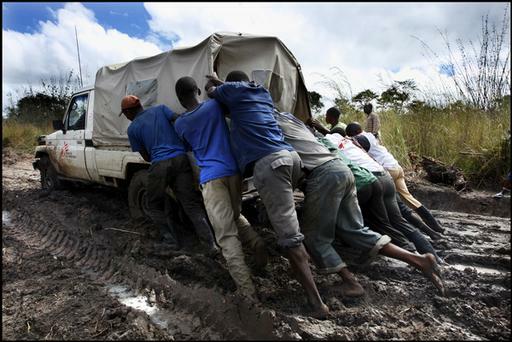 An MSF car gets stuck in the muddy road to Shamwana. To my right I see a crowd of people under a large mango tree, encircling someone lying on the ground. Suddenly a young man breaks away from the group, his clothes stained with blood. He runs towards us crying out in anguish and grief. I realise that we’re too late. I get out of the jeep and see the lifeless body of the young woman in the shadow of the mango tree, wrapped in a piece of the beautiful fabric worn by many women in Congo. Her husband is devastated and returns to lie down next to her body, holds her protectively and cries and cries. Neither he nor his wife can be more than 20-years-old. The villagers tell us more about what happened. The woman had given birth to her baby in one of the health centres run by the Ministry of Health, but after delivery the placenta had not been expelled and the woman was bleeding heavily. The family was told they needed to get to the hospital in Shamwana as quickly as possible. They hired a motorcycle taxi, and by nightfall they had managed to get as far as this village. But then the motorbike broke down, and during the hour it took the driver to repair it, the woman’s condition deteriorated. They managed to continue the journey in the dark for another hour, but then in the middle of the bush the woman lost consciousness. Around 2 am the motorbike taxi headed off to Shamwana with the newborn baby along the uneven dusty road, reaching us four hours later. According to the villagers, the woman died at 6 am - just when the motorbike reached the hospital. It's so tough to see bereaved relatives. In this case, not only did a husband lose his wife, but a tiny baby lost his mother. Trying to prevent unnecessary deaths like these is one of the most important things MSF and other organisations are working for in places like the Democratic Republic of Congo. A lot of resources are invested in training traditional birth attendants to recognise the warning symptoms and prevent infections. But unfortunately, the lack of infrastructure in Katanga, the bad roads and lack of means of transportation mean that people cannot access medical care in time. Women shouldn’t be dying during childbirth regardless of where they live. Pregnancy and childbirth are natural processes but sometimes nature needs a helping hand in the form of a midwife’s warm hands and soothing voice, or in complicated cases a surgeon’s experience and knowledge. I travel back to Shamwana with a heavy heart and go to the hospital to check on the little baby. He's doing fine. For the moment, he’s fed special nutritional milk designed specifically for babies. In a few days, when his father is done with the funeral, he will pick up his son and return home. He has a sister who can act as a wet nurse for the baby. Although we could not save the mother’s life, at least we could help her baby."